A lifelong resident of this U City neighborhood, the owner has transformed a historic home into a have for her family. 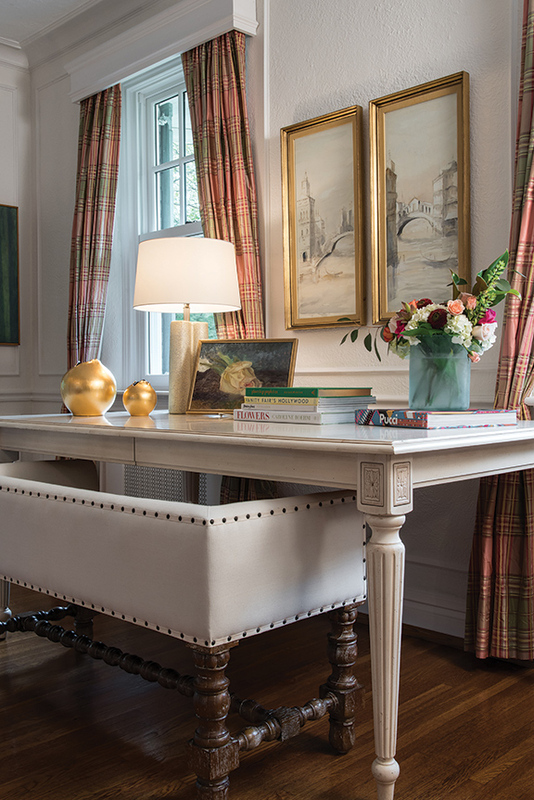 By combining two previously owned pieces - the family's former dining table and an upholstered bench, the owner created an inviting space in the "functional" living room where the children often do their homework. 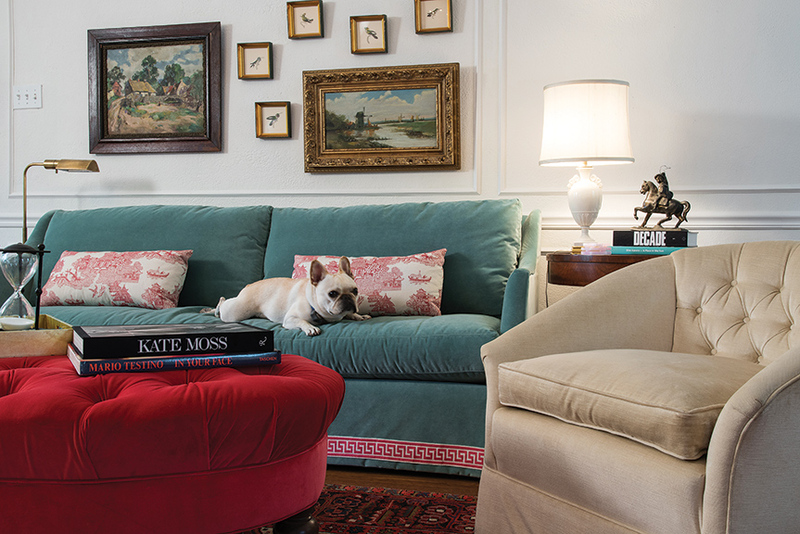 Rich with color, the living room is designed for comfort (to the delight of George, the family's French bulldog). Much of the furniture is on casters for easy rearrangement, and a collection of heirloom artwork is displayed above the sofa. 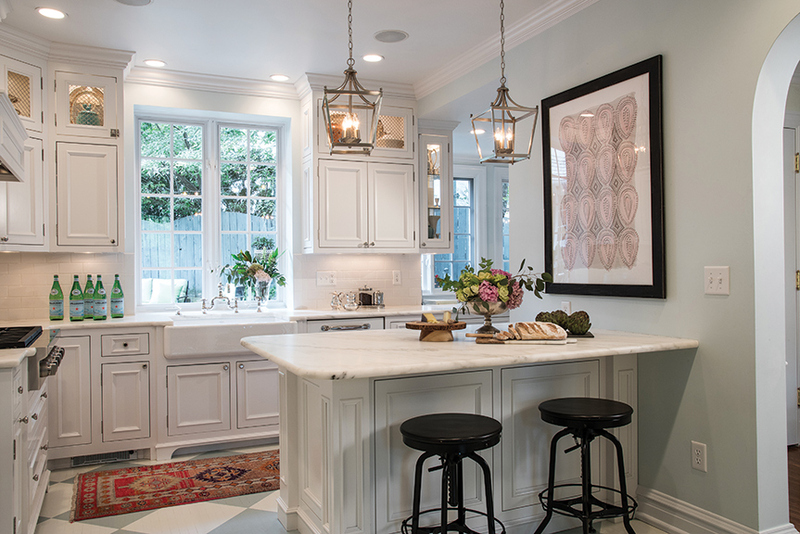 Danby marble tops the kitchen counters and the peninsula, which has a built-in oven and microwave drawer. Traditional farmhouse decor elements include wire-fronted upper cabinets, an apron sink with a lovely view of the pool area and the floor painted in a large checkerboard pattern. 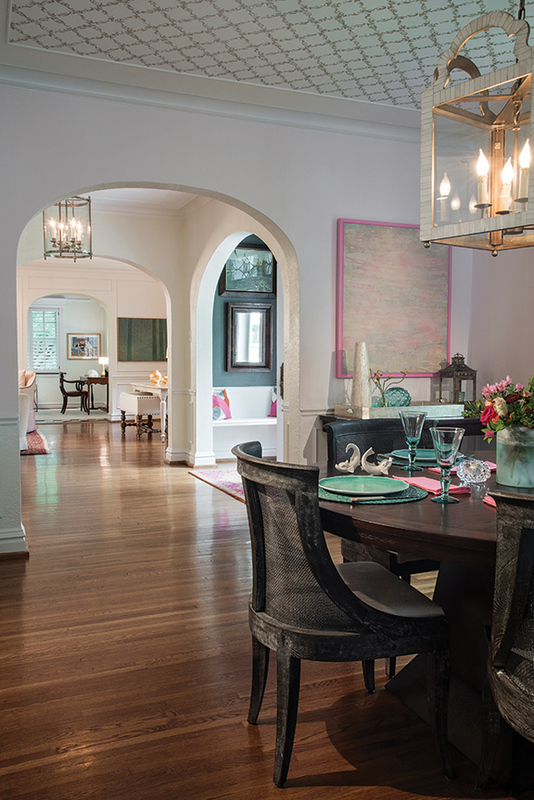 Open archways establish a continuous flow from the formal dining room to the foyer, living room and den. 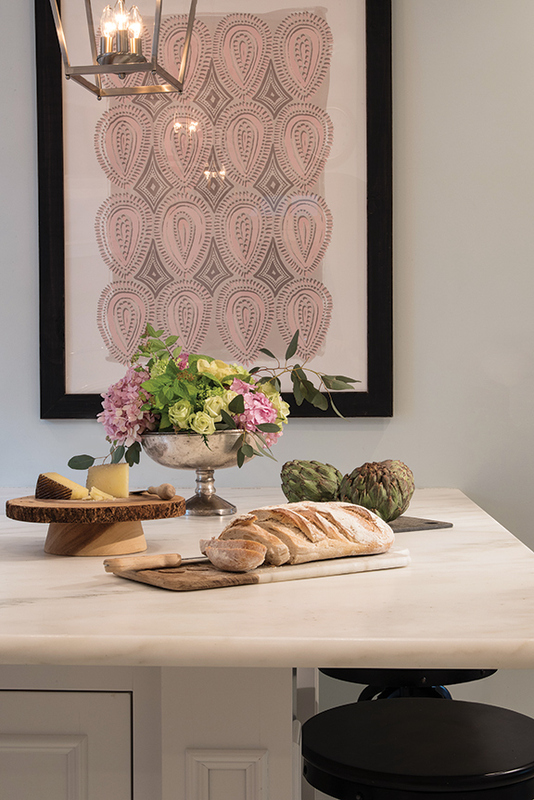 Accenting the tobacco-stained dining ensemble are a bone lantern, an abstract by St. Louis artist Albert Kuo and the decorative ceiling, wallpapered in a metallic trellis pattern. Against the living room's rear wall, pastel-plaid silk drapes and an Albert Kuo painting inspired by Monet's Water Lilies complement a lushly cushioned settee in a botanical print. 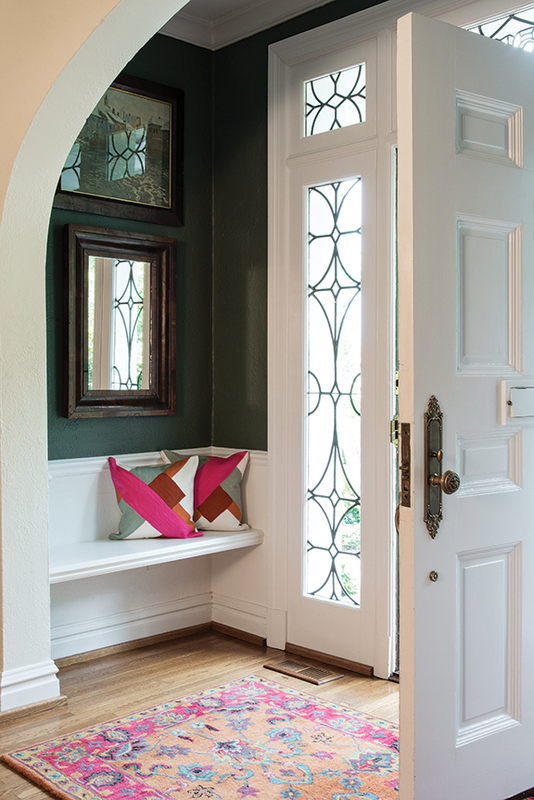 Reflected in a mirror from the owner's childhood home, leaded glass surrounds the entry door, and a handy bench was added to the foyer. Once farmland, University City’s original 85 acres were purchased in 1902 by Edward Gardner Lewis for his publishing headquarters, with future plans to develop the area into a “high-class residential district” and a model “City Beautiful.” The city’s population quadrupled during the 1920s, and in 1927 Cyrus Walbridge Merrell, a former executive with the J.S. Merrell Drug Co., decided to build his home in a newly formed subdivision. The Colonial Revival-styled residence changed hands several times over the next eight decades and was purchased by its current owners in 2009. The wife had grown up in the immediate neighborhood, and happy memories of this “urban oasis” had prompted the couple to start their family here several years before. They’d long admired the Merrell residence, with its detached carriage house, private setting and scenic views of the community park. And when a for-sale sign appeared in the front yard, they wasted no time acquiring the dignified 3,600-square-foot two-story. Exterior renovations began immediately. The steep front yard was regraded and terraced, and repairs were made to the pool area. Too narrow to allow for today’s vehicles, two of the carriage house’s arched entries were converted to garage doors, but the third was retained to preserve the building’s original character. Four years later, it was time to tackle the main level – a major undertaking that entailed a complete remodel of the kitchen and family dining area, creating an opening to the formal dining room, and adding a bar alcove and a “landing zone” with bench and cubbies off the screened porch. Designed by Thomas McGraw and built by Oberle Construction, the activity spaces now reflected the family’s contemporary lifestyle, while preserving the home’s classic styling. Demonstrating her flair for design, the owner personally selected the interior furnishings. A lush mix of color, pattern, new and repurposed pieces, family heirlooms, original artwork and framed handiworks by her children, all were chosen for their comfort, functionality and treasured memories. Although expanded, the kitchen’s dimensions didn’t allow for an island, but the peninsula provides plenty of functional workspace, with a Danby marble surface and an integrated oven and microwave drawer. Crackle-glazed Italian subway tile backs the 6-burner Wolf range and pot filler, an apron farmhouse sink overlooks the outdoor area and the “indispensable” coffeemaker has its own niche. Open to the kitchen and lit by windows on two sides, the family dining/breakfast room required some ingenuity. The updated home combines the original radiant heating with forced air, and radiators were located in the corner where the owner wanted to place a banquette. 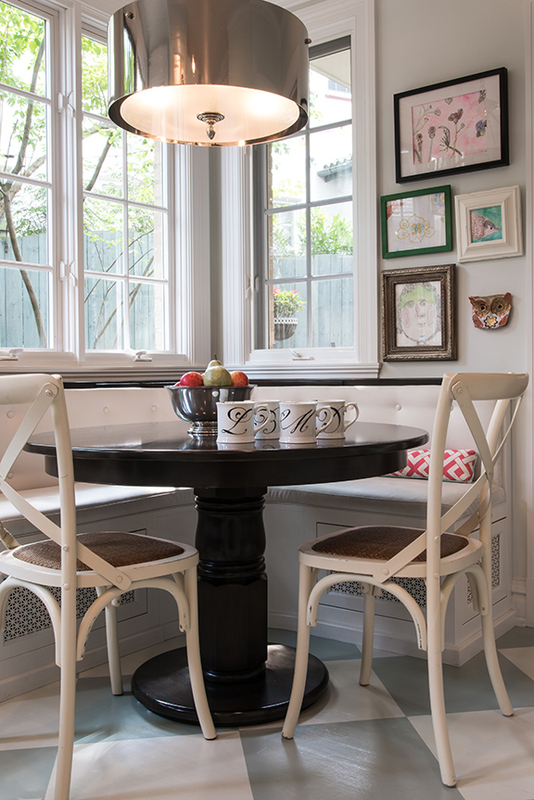 The problem was cleverly solved by installing a custom banquette over the radiators, with decorative base grilles that allow the heat to circulate. To unify the space, the cabinetry, workstation and table were all custom-made in ebony-stained walnut. Now accessible from the foyer and kitchen, the formal dining room is centered by a tobacco-stained table and graceful, open-weave cane-backed chairs with comfy upholstered seats. Many of the new furnishings were sourced by designer Marci Marsh, of Frill, who also suggested the dining room’s unique ceiling treatment – wallpaper in a pewter metallic trellis pattern, framed by the original plaster bead and contoured to extend into the new bar alcove. Vibrant with color, the living room showcases a green velvet sofa facing the wood-burning limestone fireplace, which is topped by an Andrew Millner ink artwork, and a large tufted ottoman in vivid raspberry that substitutes for a coffee table. 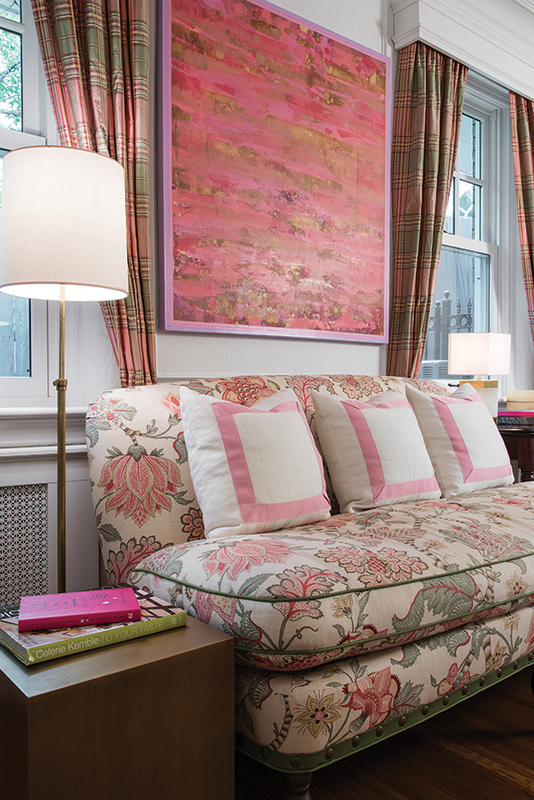 Pastel plaid drapes flank the windows; a collection of family heirloom paintings is displayed above the sofa; and additional seating includes a botanical print settee and creamy beige barrel chairs that once belonged to the owner’s grandmother. An open archway leads to the adjacent den – a large, sunny multi-purpose space where the family gathers to watch TV and play board games. Plantation shutters deck the windows, and memory-filled appointments include a needlepoint desk chair (another family heirloom) and a painting of the owner and her sisters. Fresh air activities start from the screened porch, which offers enticing views of the pool area. Dominated by various shades of turquoise, the porch’s painted floor tiles and cushioned rattan furniture produce a tropical effect, with navy accessories for contrast. Arrayed with bright pink towers of mandevilla, one end of the pool deck was expanded to allow for a fabulous semicircular seating ensemble, sheltered by an oversize umbrella. At the opposing end, a historic dogwood tree provides shade, and the entertainment area continues around the side of the house. Refurbished with capped rock retaining wall, this inviting space features a grill, dining table, lounges and chairs, and a lovely shade garden planted with hosta and New Guinea impatiens. In today’s transient society, the opportunity to “put down roots” has become increasingly rare. With innovative planning and design, this fortunate owner has created a home well-adapted to modern living, yet thoroughly respectful of tradition.